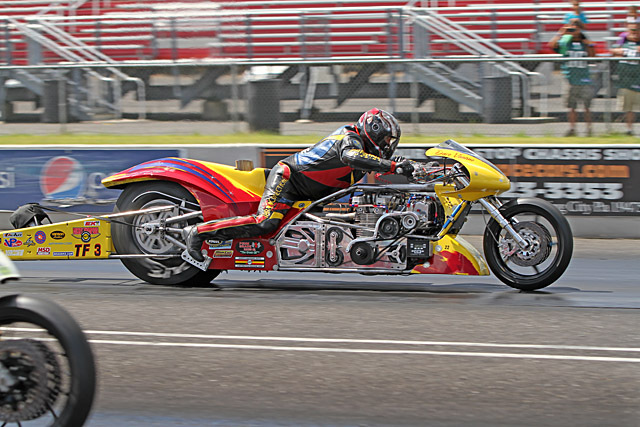 New Jersey’s legendary Atco Dragway ranks as one of the world’s spiritual homes of motorcycle drag racing, and the 45th annual Orient Express Motorcycle U.S. Nationals is the nation’s oldest two wheeled, quarter mile event. 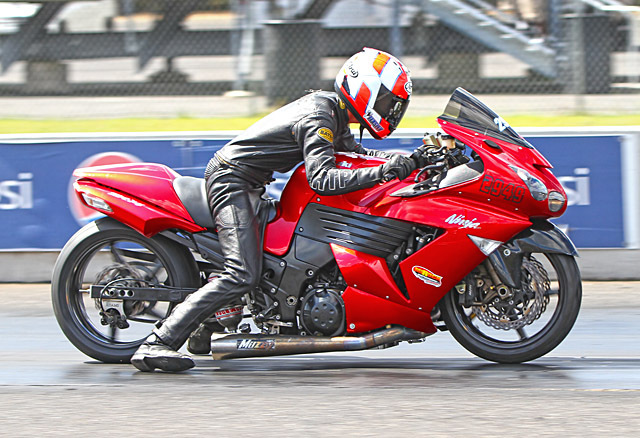 So when the Mickey Thompson MIROCK Superbike Series rolled into Atco for the Nationals on September 5-7, no one expected anything less than a good-time, East Coast reunion atmosphere and blistering performances. They got both. Larry “Spiderman” McBride was a fan favorite at Atco. Sure, Saturday night’s rain put the kybosh on Top Fuelers spewing header flames high into the night time sky, but since Atco has its own bar and the Big East’s toughest racers had some catching up, bench racing, and pool hustling to do, no one seemed to mind. One of those living it up was second-year Top Fuel racer David Vantine, who has turned the U.S. Nationals into a pit party ever since he first started racing at this, the closest event to his Hamilton, New York home. 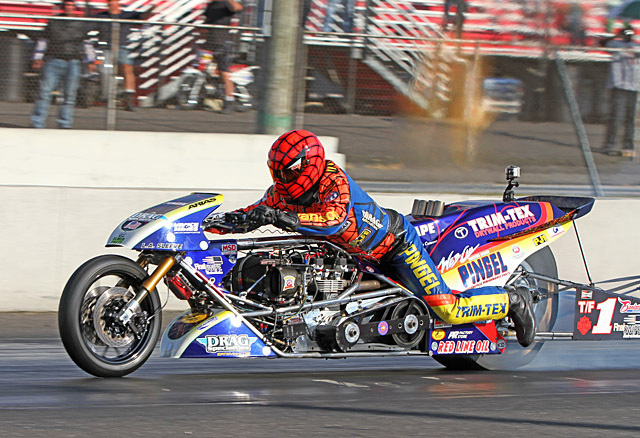 And this time Vantine gave the faithful what they’d been waiting for—2 out of 3 match race wins against perennial Top Fuel champion Larry “Spiderman” McBride. Larry’s brother Steve McBride has been trying to get some new clutch disks comfortable in the Blue Bike and hasn’t yet found the sweet spot. Although McBride did run a 5.96 midday on Sunday, he smoked the tire twice in the rubber match and Vantine scored his first Top Fuel overall win. 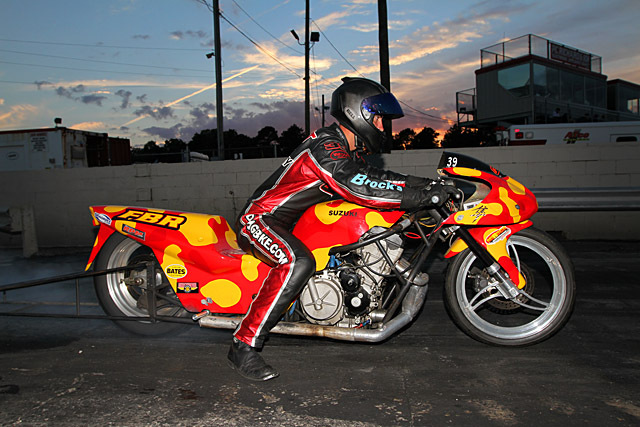 Joey Gladstone once again ran a 6.90 in eliminations, stoking anticipation for the first 6.80 streetbike pass. Another racer squeezing the nightlife out of the event was Orient Express Pro Street champion Joey Gladstone. Being a Saturday bad-boy must have been a key to Sunday success, as Gladstone too joined Vantine in Atco’s stylish winners circle. With a broke bye to start his day, Gladstone faced only his DME Racing teammates Terence Angela and Jason Dunigan in anger. Gladstone had something for them both, although the final round against Angela was made close when Terence took the tree. Joey once again ran a 6.90 in eliminations, stoking anticipation for the first 6.80 streetbike pass. Rickey Gadson always activates his GoPro camera in the waterbox, but this time the thing wouldn’t start up. 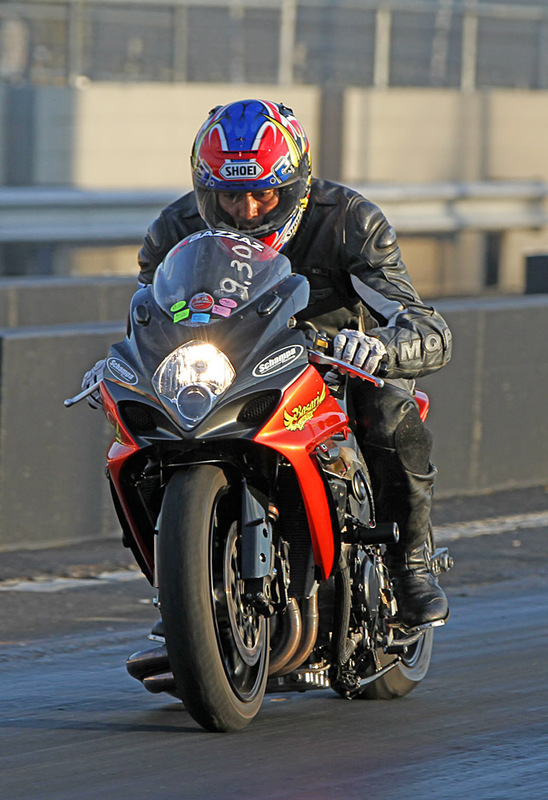 Real Street has gotten so competitive that points leader Jeremy Teasley rang the Atco scoreboard to the tune of 204.60 mph on his 63 inch, nitrous-huffing, RS Motorsports ZX14. 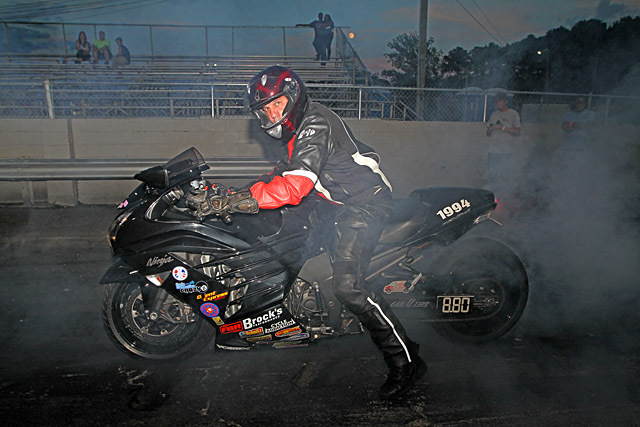 Real Street has gotten so competitive that points leader Jeremy Teasley rang the Atco scoreboard to the tune of 204.60 mph on his 63 inch, nitrous-huffing, RS Motorsports ZX14. No doubt that Teasley actually dropped the front wheel in the traps to read that kind of speed, but it generated a lot of excitement nonetheless. Simply that Teasley was still on the back wheel entering the trap on a 7.84 pass was impressive enough. 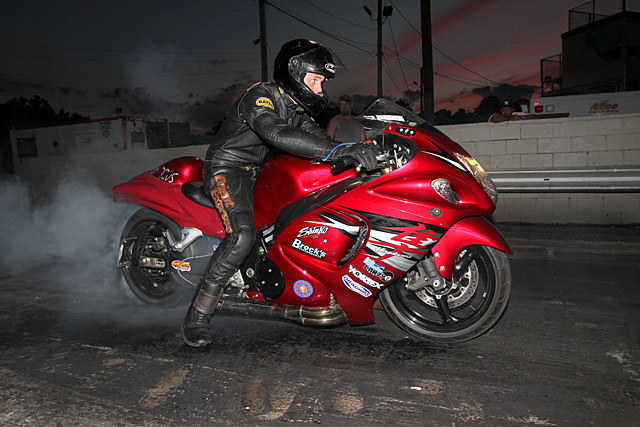 Teasley took the final round win with a 7.89 against Chapman, who’s circling in on a consistent tune-up for his turbo Suzuki Hayabusa, and ran low ET of the class with a 7.78. In addition to his Real Street runner-up, Eddie “Who” Chapman took the Cycle Connection Crazy 8s win. Chapman was quietly on fire at Atco. In addition to his Real Street runner-up, Eddie “Who” took the Cycle Connection Crazy 8s win. Chapman won when Fun-For-All’s Ron Arnold redlit by -.005 in the final of the crazily competitive class. Robert Parker was number 1 qualifier. North Carolina’s Bobby Lovingood was racin’ good this weekend, all the way to the Louis Concrete 4.60 win over number 1 qualifier Eran Pielert. 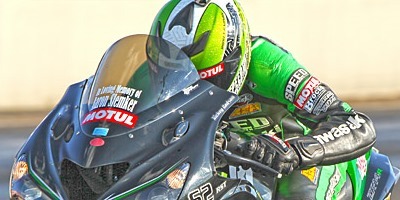 “Three finals in a row and no wins,” grumbled Pielert, who had an .008 light in the final of the world’s quickest motorcycle index class. But he slowed to a 4.76 and Lovingood’s .010/4.65 package took the win. Ben Knight rode Marion Ford’s ATAK to the FBR Shop 5.60 final round win over points leader Michael Ostrowski, who redlit by -.012 but keeps himself in a good points position as the season heads into its last two races. Veteran racer Dave Cornnell was number 1 qualifier. 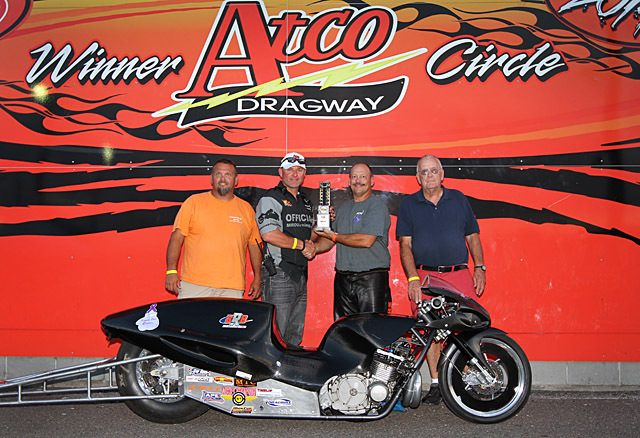 Connecticut Kawasaki Kingpin Bob Carlson took the Trac King/APE Top Sportsman win when Jeff Cesari broke in the waterbox. 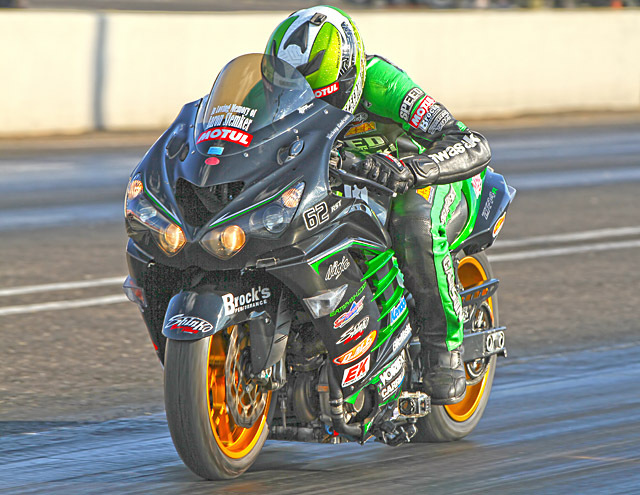 That doesn’t mean it was easy, as Carlson fought his way through the quickest 32 bikes out of the Pro ET field, including former NHRA Pro Stock Motorcycle racer Sam Hurwitz and championship rivals Brian Canoles and George Shriver. Brock’s Performance Street ET was all about keeping up with the Jones’s, as Jerry Jones rode one of Ashon “Capo” Dickerson’s bikes to the final round win over Scott Jones. Brock’s Performance Street ET was all about keeping up with the Jones’s, as Jerry Jones rode one of Ashon “Capo” Dickerson’s bikes to the final round win over Scott Jones. 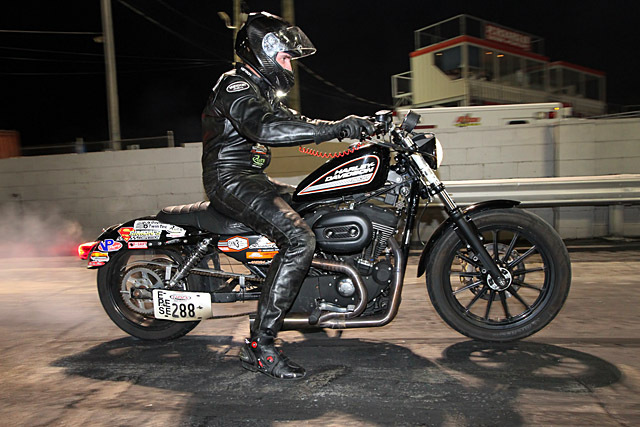 Kevin Gauntt proved once again that the slow way is often the best way, winning Fast by Gast Pro ET with an 11.10 dial-in aboard his 883 Sportster. 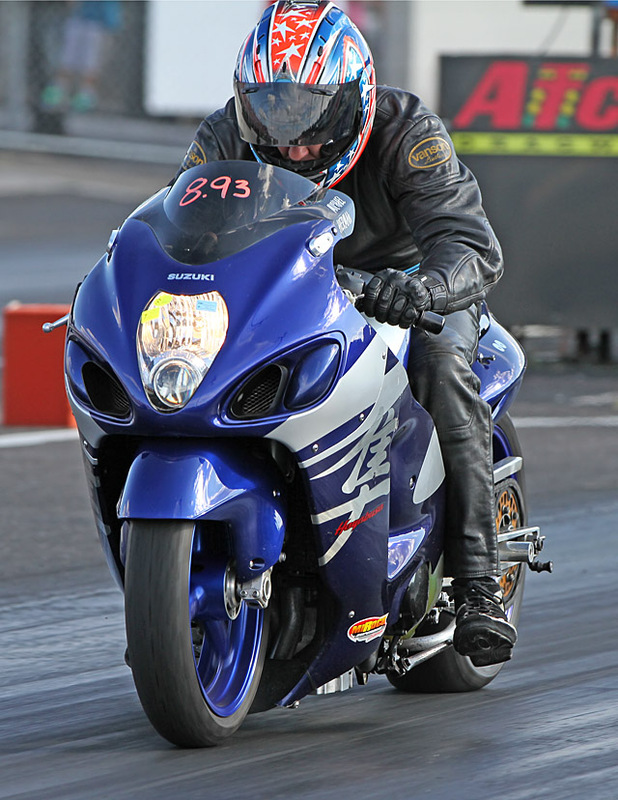 The wait was just too much for Barry Stephens, who redlit by -.005 on his 9.54 dragbike. Michael “Ice Cold Killer” Herman Jr. won Friday’s Gamblers Race over his dad with a .003 light—that’s just how cold Junior is. And last and most unique to Atco, the motorcycle clubs that cruise the Philly highways and byways don full leathers to hit the quarter mile and battle club vs. club in the annual Rickey Gadson Club Wars race. Kris McLaughlin took the win over Jay Cook in an all-Wild Bunch MC final. Iconz MC was most represented both on the track and in the stands. 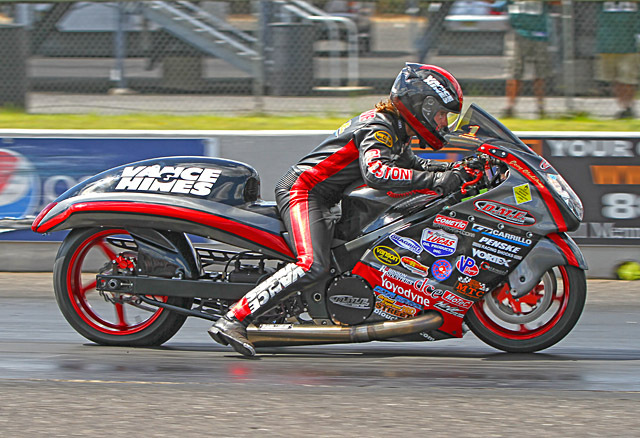 The best just keeps getting better as the Mickey Thompson Performance Tires MIRock Super Bike Series—the world’s largest—returns to Maryland International Raceway for the 22nd Annual Fast by Gast Fall Nationals featuring the awesome $10,000-to-win Orient Express Pro Street Battle Royale on October 3-5, 2014.
most unique to Atco, the motorcycle clubs that cruise the Philly highways and byways don full leathers to hit the quarter mile and battle club vs. club in the annual Rickey Gadson Club Wars race. 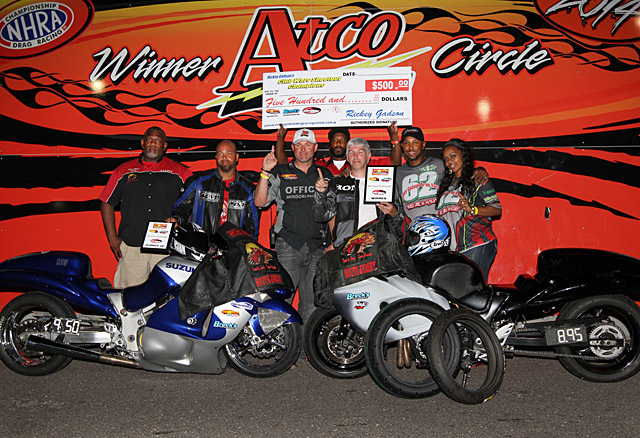 Kris McLaughlin took the win over Jay Cook in an all-Wild Bunch MC final. Michael Herman Jr had an impressive weekend.